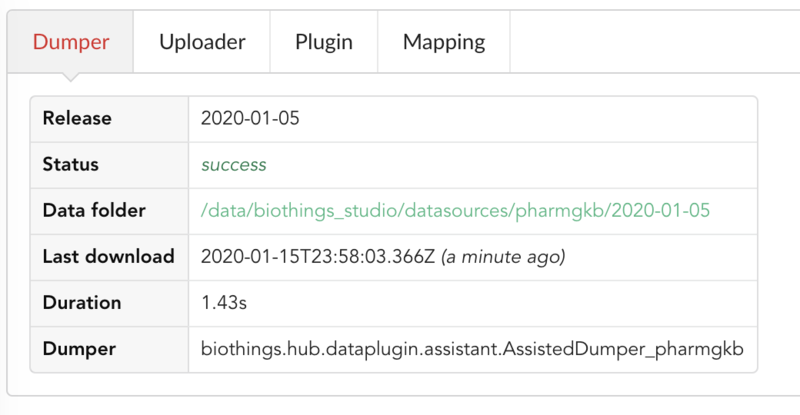 This tutorial will guide you through BioThings Studio, a pre-configured environment used to build and administer BioThings API. 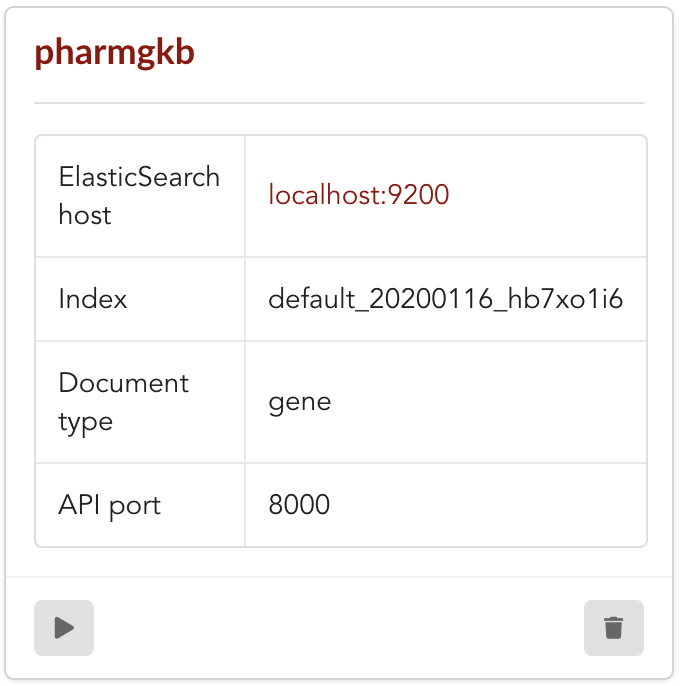 This guide will show how to convert a simple flat file to a fully operational BioThings API, with as minimal effort as possible. You may also want to read the developer’s guide for more detailed informations. The following tutorial is only valid for BioThings Studio release 0.1.e. Check all available releases for more. 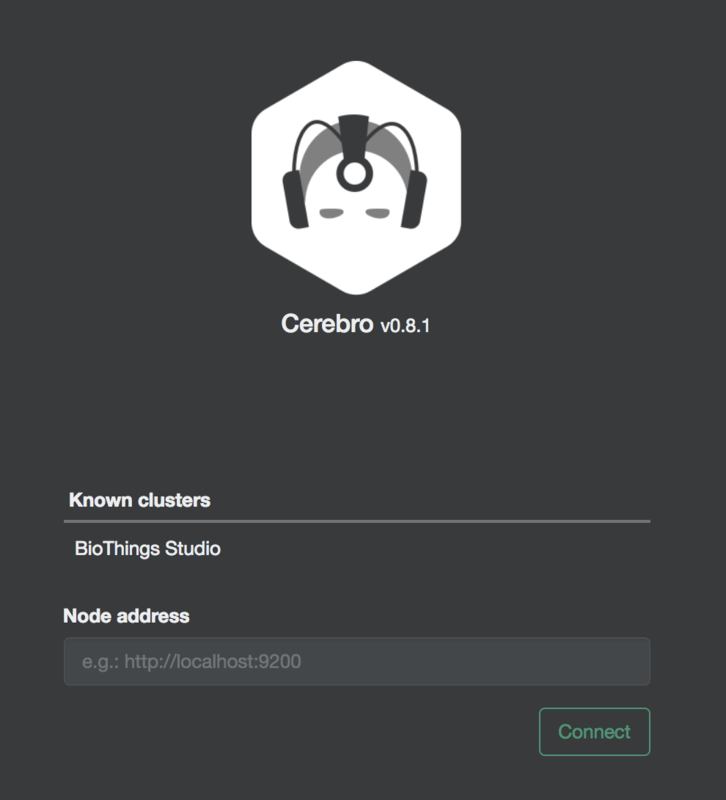 Using BioThings Studio requires a Docker server up and running, some basic knowledge about commands to run and use containers. Images have been tested on Docker >=17. Using AWS cloud, you can use our public AMI biothings_demo_docker (ami-44865e3c in Oregon region) with Docker pre-configured and ready for studio deployment. Instance type depends on the size of data you want to integrate and parsers’ performances. For this tutorial, we recommend using instance type with at least 4GiB RAM, such as t2.medium. AMI comes with an extra 30GiB EBS volume, which is more than enough for the scope of this tutorial. Typing docker ps should return all running containers, or at least an empty list as in the following example. Depending on the systems and configuration, you may have to add sudo in front of this command to access Docker server. we need to add the release number after the image name: biothings_studio:0.1e. Should you use another release (including unstable releases, tagged as master) you would need to adjust this parameter accordingly. Please refer Filesystem overview and Services check for more details about Studio’s internals. By default, the studio will auto-update its source code to the latest available and install all required dependencies. This behavior can be skipped by adding no-update at the end of the command line. We can now access BioThings Studio using the dedicated web application (see webapp overview). In this section we’ll dive in more details on using the BioThings Studio and Hub. We will be integrating a simple flat file as a new datasource within the Hub, declare a build configuration using that datasource, create a build from that configuration, then a data release and finally instantiate a new API service and use it to query our data. For this tutorial, we will integrate data from the Cancer Genome Interpreter (CGI). 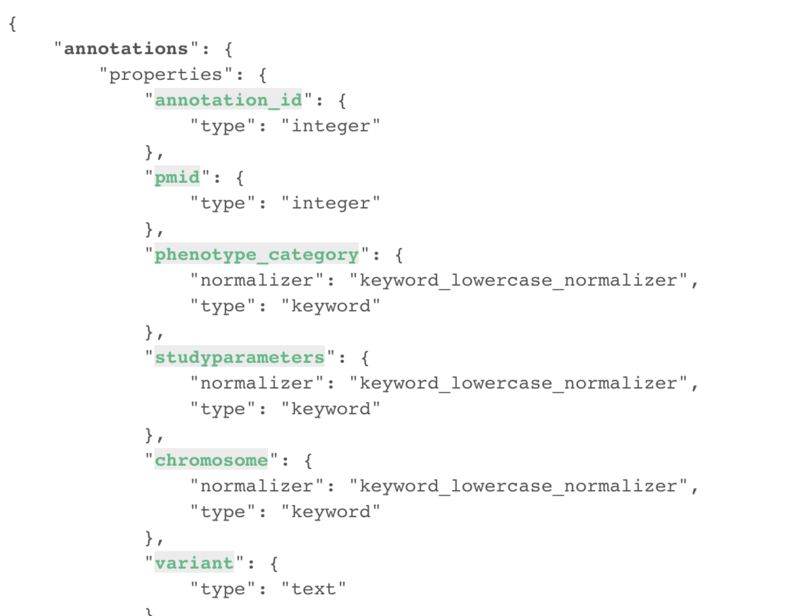 This datasource is used in MyVariant.info, one of the most used BioThings APIs. The input file is available here: https://www.cancergenomeinterpreter.org/data/cgi_biomarkers_latest.zip. The parser itself is not the main topic of this tutorial, the full code for the parser can be found here, in MyVariant’s github repository. The _id key is mandatory and represents a unique identifier for this document. The type must a string. The _id key is used when data from multiple datasources are merged together, that process is done according to its value (all documents sharing the same _id from different datasources will be merged together). all necessary files supporting the declarations in the manifest, such as a python file containing the parsing function for instance. This folder must be located in the plugins directory (by default /data/biothings_studio/plugins, where the Hub monitors changes and reloads itself accordingly to register data plugins. Another way to declare such plugin is to register a github repository, containing everything useful for the datasource. This is what we’ll do in the following section. whether the plugin comes from a github repository or directly found in the plugins directory doesn’t really matter. In the end, the code will be found that same plugins directory, whether it comes from a git clone command while registeting the github URL or whether it comes from folder and files manually created in that location. It’s however easier, when developing a plugin, to directly work on local files first so we don’t have to regurlarly update the plugin code (git pull) from the webapp, to fetch the latest code. That said, since the plugin is already defined in github in our case, we’ll use the github repo registration method. the dumper section declares where the input file is, using data_url key. Since the input file is a ZIP file, we first need to uncompress the archive, using uncompress : true . the uploader section tells the Hub how to upload JSON documents to MongoDB. parser has a special format, module_name:function_name . Here, the parsing function is named load_data and can be found in parser.py module. ‘on_duplicates’ : ‘ignore’ tells the Hub to ignore any duplicated records (documents with same _id). For more information about the other fields, please refer to the plugin specification. Moving back to the Studio, click on the tab, then icon, this will open a side bar on the left. Click on New data plugin , you will be asked to enter the github URL. Click “OK” to register the data plugin. a dumper using HTTP protocol, pointing to the remote file on the CGI website. When downloading (or dumping) the data source, the dumper will automatically check whether the remote file is more recent than the one we may have locally, and decide whether a new version should be downloaded. and an uploader to which it “attached” the parsing function. This uploader will fetch JSON documents from the parser and store those in MongoDB. 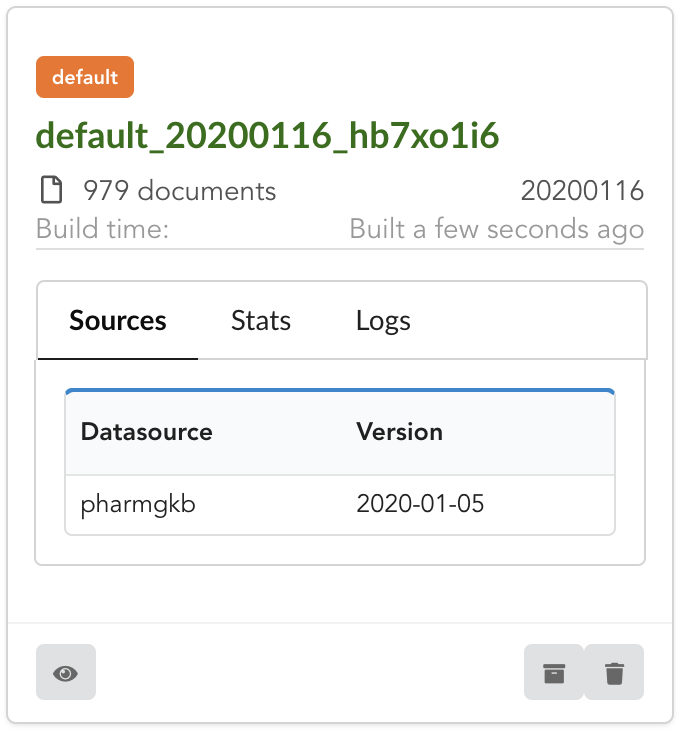 At this point, the Hub has detected a change in the datasource code, as the new data plugin source code has been pulled from github locally inside the container. In order to take this new plugin into account, the Hub needs to restart to load the code. 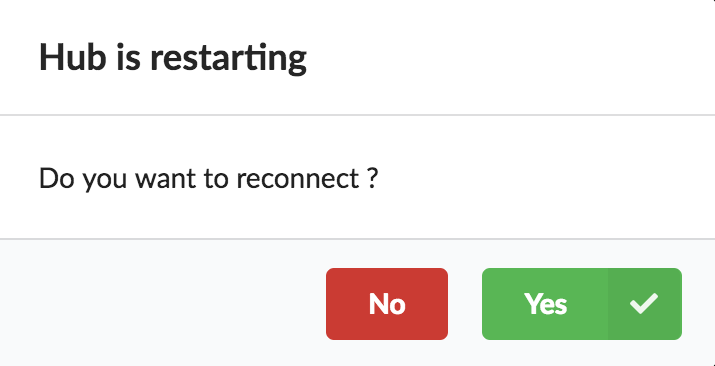 The webapp should detect that reload and should ask whether we want to reconnect, which we’ll do! Let’s open the datasource by clicking on its title to have more information. Dumper and Uploader tabs are rather empty since none of these steps have been launched yet. The Plugin tab though shows information about the actual source code pulled from the github repository. As shown, we’re currently at the HEAD version of the plugin, but if needed, we could freeze the version by specifiying a git commit hash or a branch/tag name. Without further waiting, let’s trigger a dump to integrate this new datasource. Either go to Dump tab and click on or click on to go back to the sources list and click on at the bottom of the datasource. The dumper is triggered, and after few seconds, the uploader is automatically triggered. Commands can be listed by clicking at the top the page. So far we’ve run 3 commands to register the plugin, dump the data and upload the JSON documents to MongoDB. All succeeded. 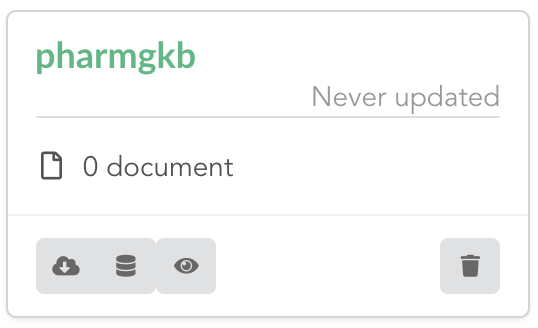 Same for the Uploader tab, we now have 323 documents uploaded to MongoDB. Now that we have integrated a new datasource, we can move forward. Ultimately, data will be sent to ElasticSearch, an indexing engine. In order to do so, we need to tell ElasticSearch how the data is structured and which fields should be indexed (and which should not). 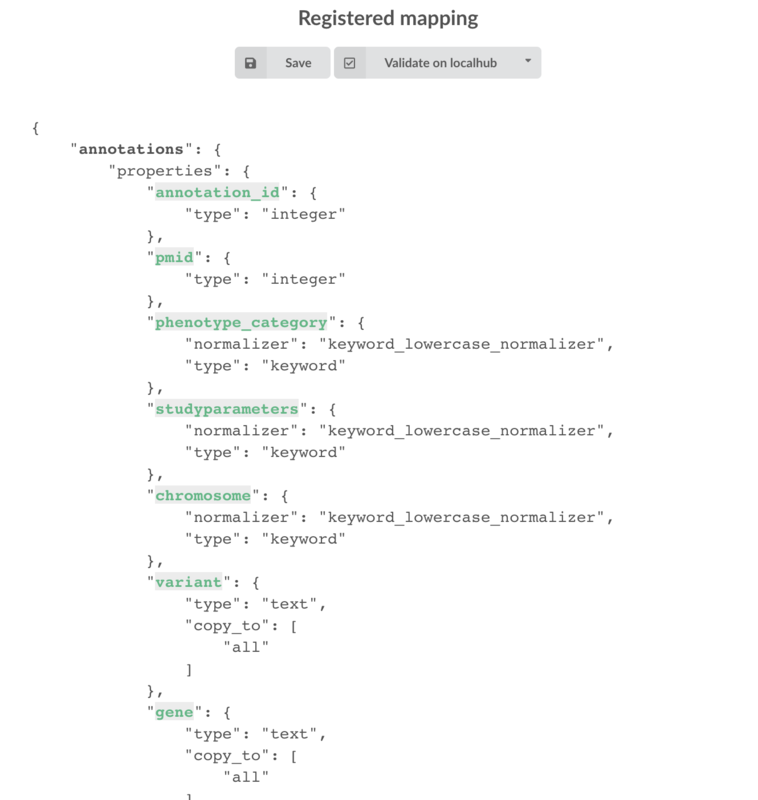 This step consists of creating a “mapping”, describing the data in ElasticSearch terminology. This can be a tedious process as we would need to dig into some tough technical details and manually write this mapping. Fortunately, we can ask BioThings Studio to inspect the data and suggest a mapping for it. In order to do so, click on Mapping tab, then click on . We’re asked where the Hub can find the data to inspect. Since we successfully uploaded the data, we now have a Mongo collection so we can directly use this. Click on “OK” to let the Hub work and generate a mapping for us. Since the collection is very small, inspection is fast, you should have a mapping generated within few seconds. 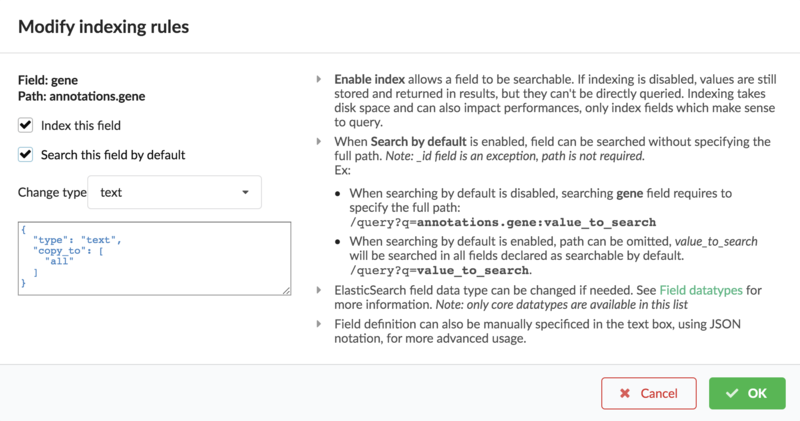 For each field highlighted in blue, you can decide whether you want the field to be searchable or not, and whether the field should be searched by default when querying the API. Let’s click on “gene” field and make it searched by default. Indeed, by checking the “Search by default” checkbox, we will be able to search for instance gene “ABL1” with /query?q=ABL1 instead of /query?q=cgi.gene:ABL1. “Validate on test” means Hub will send the mapping to ElasticSearch by creating a temporary, empty index to make sure the mapping syntax and content are valid. It’s immediately deleted after validation (wheter successful or not). Also, “test” is the name of an environment, by default, and without further manual configuration, this is the only development environment available in the Studio, pointing to embedded ElasticSearch server. 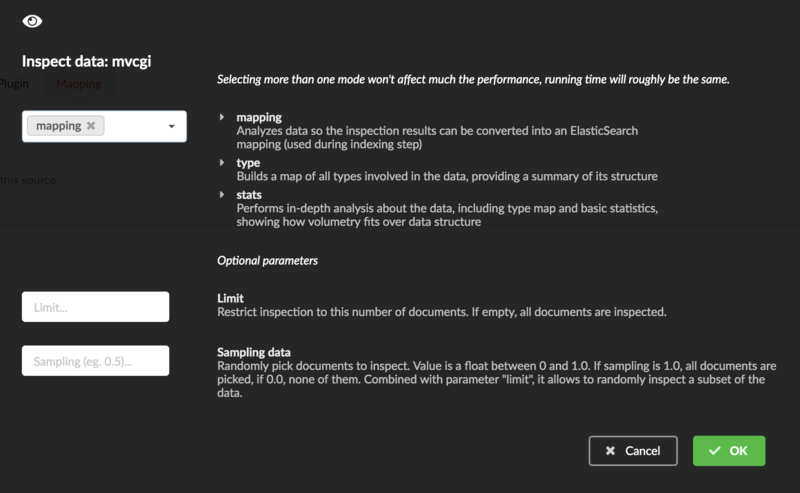 Once we have integrated data and a valid ElasticSeach mapping, we can move forward by creating a build configuration. 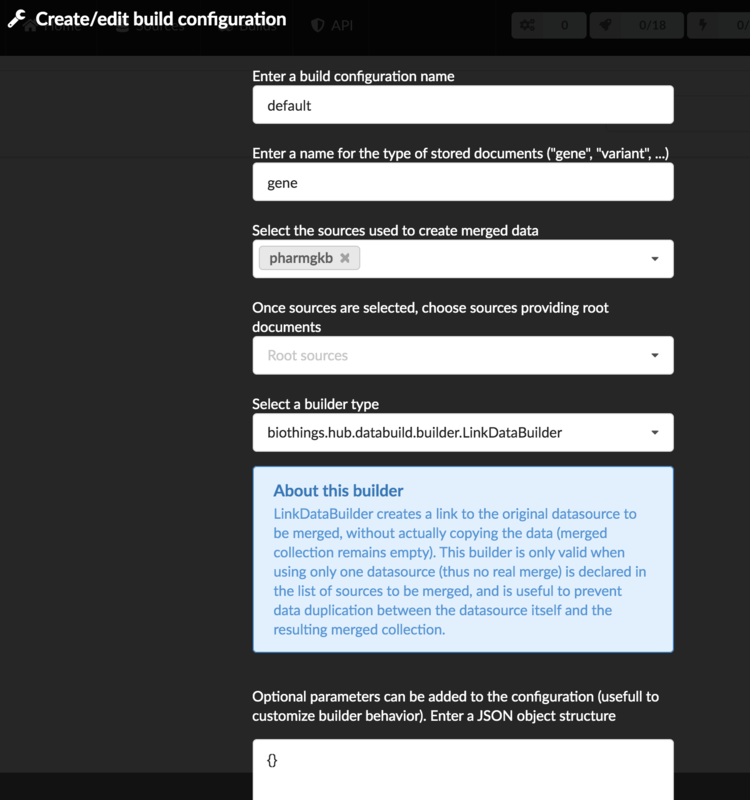 A build configuration tells the Hub which datasources should be merged together, and how. Click on then and finally, click on . Click “OK” and open the menu again, you should see the new configuration available in the list. Click on it and create a new build. You can give a specific name for that build, or let the Hub generate one for you. Click “OK”, after few seconds, you should see the new build displayed on the page. Open it by clicking on its name. You can explore the tabs for more information about it (sources involved, build times, etc…). The “Release” tab is the one we’re going to use next. If not there yet, open the new created build and go the “Release” tab. This is the place where we can create new data releases. Click on . Since we only have one build available, we can’t generate an incremental release so we’ll have to select full this time. Click “OK” to launch the process. Hub will directly index the data on its locally installed ElasticSearch server (test environment). After few seconds, a new full release is created. We can easily access ElasticSearch server using the application Cerebro which comes pre-configured with the studio. Let’s access it through http://localhost:9000/#/connect (assuming ports 9200 and 9000 have properly been mapped, as mentioned earlier). Cerebro provides an easy to manager ElasticSearch and check/query indices. Click on the pre-configured server named BioThings Studio. When running, queries such /metadata and /query?q=* are provided as examples. They contain a hostname set by Docker though (it’s the Docker instance hostname), which probably means nothing outside of Docker’s context. In order to use the API you may need to replace this hostname by the one actually used to access the Docker instance. The final step would then be to deploy that API as a cluster on a cloud. This last step is currently under development, stay tuned! First make sure all services are running. Enter the container and type netstat -tnlp, you should see services running on ports (see usual running `services`_). If services running on ports 7080 or 7022 aren’t running, it means the Hub has not started. If you just started the instance, wait a little more as services may take a while before they’re fully started and ready. If after ~1 min, you still don’t see the Hub running, log to user biothings and check the starting sequence. Press Control-B then D to dettach the tmux session and let the Hub running in background. 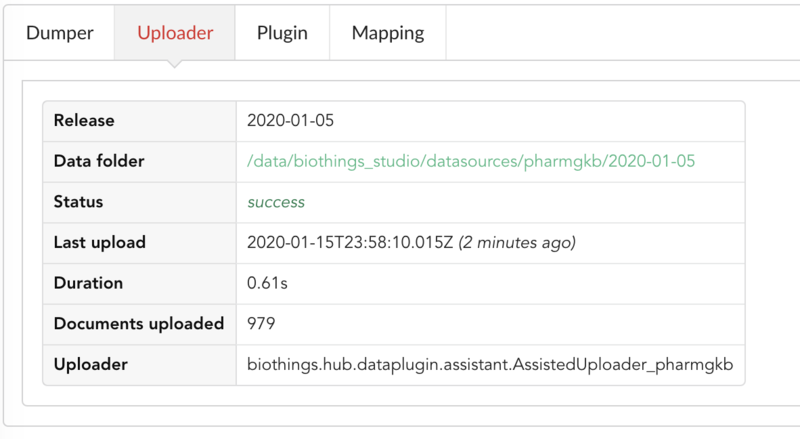 By default, logs are available in /home/biothings/biothings_studio/data/logs.